Give the birds what they need, and add color and structure to your garden, with shrubs. Our For the Birds Collection includes the Early Amethyst Japanese Beautyberry, the Brilliantissima Chokeberry and the Summer Snowflake Viburnum. All three varieties provide gorgeous flowers in the spring or early summer, and all produce berries that birds can feast on in the fall and winter. 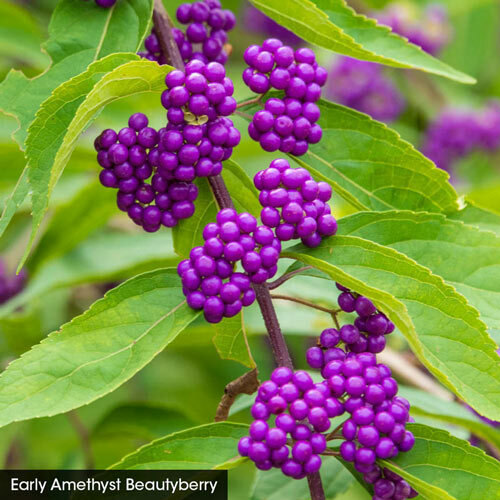 The Early Amethyst Japanese Beautyberry has small lavender-pink flowers that open in early summer and are followed by brilliant, bubblegum purple berries that birds love. Grows 3-4' tall with a 4-5' spread. A native to the eastern part of North America, the Brilliantissima Chokeberry produces clusters of white to light pink flowers in spring. They're followed by dense clusters of glossy, red fruits. 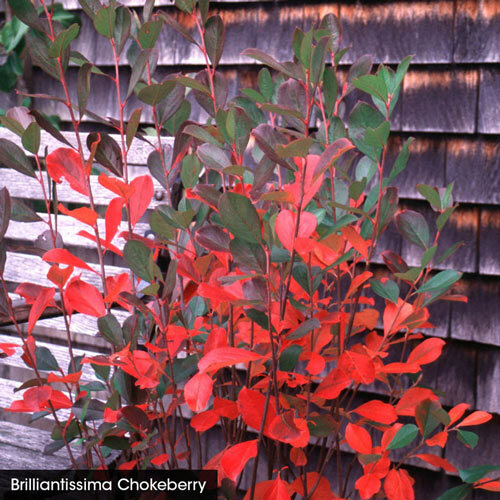 The chokeberry's foliage turns bright red in the fall. Grows 6-8' tall with a 3-4' spread. 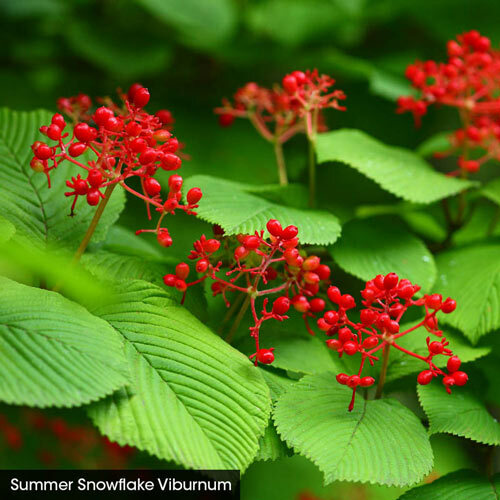 The upright Summer Snowflake Viburnum bears loads of white lacecap-type blooms starting in mid spring and continuing throughout the summer season. The red fruit matures to black. This native shrub grows 3-5' tall with a similar spread. Planting InstructionsNone special. But better berry crop is achieved with more than one viburnum planted. Flower FormSmall single flower clusters arranged in dome-shaped cymes. Foliage TypeLeaves begin green and turn shades of maroon and golden yellow in fall. Soil RequirementAverage well drained soil. Does not tolerate chalky or alkaline soils. PruningDo any pruning after flowering. Take care not to prune too heavily or fruit production will be reduced. Flower Formflowers are white or pale pink, 1 cm diameter, with glandular sepalssmall, with 5 petals and 5 sepals, and produced in corymbs of 10-25 together. Hypanthium is urn-shaped. Foliage Type5-8 cm long and densely pubescent on the undersideThe leaves are alternate, simple, and oblanceolate with crenate margins and pinnate venation; in autumn the leaves turn a bold red color. Dark trichomes are present on the upper midrib surface. 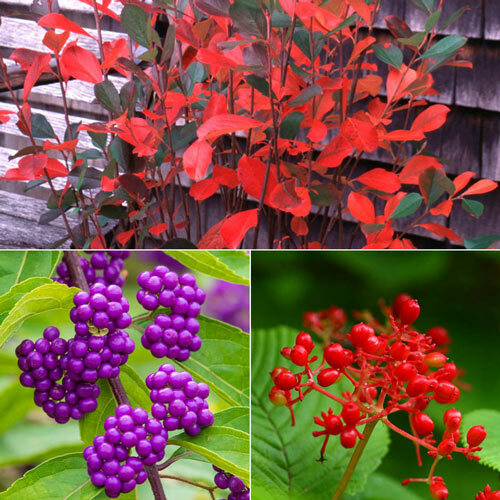 Unique Characterstics'Brilliantissima' typically grows slowly to 6-8' tall and is perhaps most noted for its attractive glossy red berries and red fall foliage color. It primarily differs from the species by (1) being more compact, (2) producing more lustrous foliage with superior red fall color and (3) producing larger, glossier and more abundant fruit. Foliage TypeElliptic to oblong, shiny medium to dark green leaves. In autumn they display a breathtaking maroon-red color. 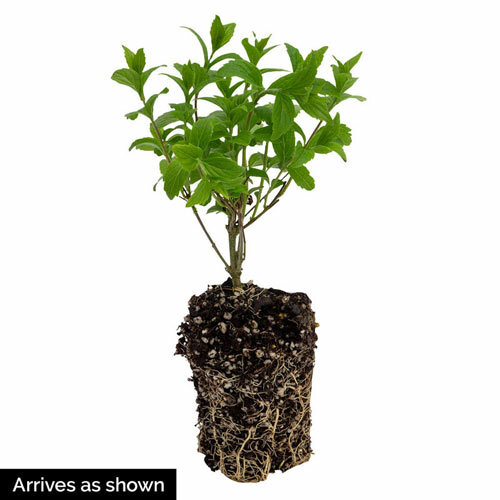 Additional InformationViburnum plicatum, commonly called Japanese snowball bush, is a dense, upright, multi-stemmed, deciduous shrub which produces snowball-like spherical inflorescences of sterile white flowers along its branches in spring. This species is sterile. Unique Characterstics'Summer Snowflake' is an upright cultivar that matures to 5-8' tall (infrequently taller). Leaves, flowers and fruits are typically smaller than those found on typical f. tomentosum plants. White lacecap-like flowers bloom in spring (late April-May), but continue to bloom sporadically through summer (hence the cultivar name) and sometimes into early fall. Fruits, a few flowers and autumn foliage color may all be simultaneously present on shrubs in early fall. Introduced by the Canadian Ornamental Plant Foundation. Soil RequirementFertile, well drained soil.